Kyra Markham was born Elain Hyman in Chicago, Illinois. She studied at the School of the Art Institute of Chicago until she was discovered as an actress by Maurice Brown in 1909. For the next several years she worked in the theater and motion picture industry in Chicago, Provincetown and Los Angeles. In 1927 she revived her interest in art, resuming her studies at the Art Students League in New York with Alexander Abels. 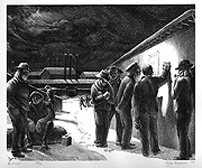 In 1935, Markham was selected for the prestigious Mary S. Collins Prize at the Philadelphia Print Club's annual exhibition. Edition 50. LC 2. Signed, titled, dated and numbered in pencil. Signed in the stone, lower left. Image size 10 1/16 x 12 1/8 (255 x 307 mm); sheet size 11 7/8 x 16 inches (302 x 406 mm). A fine, rich impression, with full margins (3/4 to 2 inches), on cream wove paper, in excellent condition. 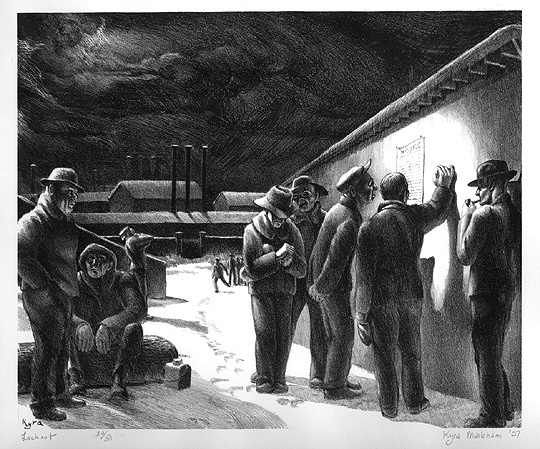 Reproduced: A Nation on the Move: Industrial Prints of America, Nassau County Museum of Fine Art, New York, 1988; The American Scene on Paper; Prints and Drawings from the Schoen Collection, Georgia Museum of Art, University of Georgia, 2008. Collection: LC Purchase, Pennell Fund.